The writing of a dissertation is a lengthy, complicated, and challenging process. To be honest, it was also a very satisfying process, enabling me to focus entirely upon issues, arguments, ideas, and whole ways of thinking that one rarely has the opportunity to do with such single-minded focus. The process has opened my eyes to many things, enabling me to enter the world of academia with enthusiasm for the possibilities that lie ahead. To make a contribution to the accumulated knowledge of humanity is a privilege, one I take very seriously. For this reason, I have welcomed the sometimes intense scrutiny that is brought to bear when assessing academic work. Not many areas of human endeavour comes under such careful examination, each word required to justify its presence, each idea invoked required to be fully explicated, used with exacting accuracy, and with all arguments against it taken into consideration. It is challenging to be required to be entirely up to date on the status of intellectual work. One must first gain a broad understanding of the genesis of ideas, and then track the varying issues and arguments it brings up, analysing as you go, to come to a personal understanding, and position. In producing my dissertation I calculate that I read well over one thousand academic papers. My library of references, built over a year of study, contains approximately 730 titles, and does not include those I read that were not relevant. My dissertation includes 14 pages of references, in both the body of the paper and in one extensive appendix. To have had the support from my wonderful partner, Amanda, and the excellent encouragement and mentoring of my academic advisor, Dr. Jen Carter, and the rest of the faculty at the University of the Sunshine Coast, has been a real delight, one I aim to honour by carrying on the project of study originally proposed. I am happy to report that I have been awarded a bachelors degree, BSocSc (Hon) in the field of Animal Geography. It is an Honours Degree First Class. I have been offered a candidature in the PhD research program, and several scholarships. The coming year will see the beginning stages of an extensive research project into the representations of, and varied understandings of, Dolphin-Assisted Therapy, as my PhD research project. My dissertation, "The Dolphin-Human Connection: Embassy or Zoo-without-walls? ", will be made available to read online soon. Altho it is meant for an academic audience, there are parts of it that should make interesting reading to the more general public. and many more areas. Our work has spanned 26 years now and continues, as our dedication remains unabated. Our latest efforts to find a location for a re-established Dolphin EDventures Wellness Program have, so far, not yielded a suitable location. We remain hopeful a facility with an enlightened management will be found, where we can demonstrate the four-way success that is possible – for the facility, for the guests, for us, and most especially for the dolphins. At present our plans have taken yet another direction, one that we have always known was coming: a return to the Academic world, in pursuit of a Doctorate. We have seen many inroads over the last ten years, advances (if this word can be used here -- smile) against work done by many dedicated people, making the human-dolphin connection stronger and more available, work that we feel has been so important. Science has been accumulating evidence of the dangers of some interactions, for both humans and dolphins. Science has attempted to show how the lives of dolphins can be, and have been, negatively impacted by human contact. While some of what has been published along this line has been well-founded, and proposals to do more to protect dolphins from foolish actions by humans, or dangerous environmental activities, are certainly welcome and necessary, we have seen another kind of reporting that is questionable. Since science is the basis for most governmental decisions regarding the management of the human-dolphin connection, it is science that must be addressed first if we want to be sure that rules, laws and the legislation that creates these are wise and helpful. In our many years of work in the field, we have seen some good come from proper management. The heavy penalties for “cowboy roundups’ of dolphins so that people can see them more easily, or swim with them in the wild, have effectively put a stop to most of this dangerous behaviour. In places where contact occurs that have instituted good education programs for the public, improved safety for both humans and dolphins has been the result. We have also seen some poor management practices. While well-intentioned, they have been unnecessarily intrusive, restricting safe, knowledgeable, and mutually beneficial interactions in some cases. 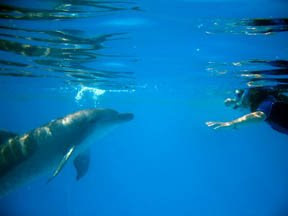 Wild encounters, compassionate interactions during strandings, and even Dolphin-Assisted Therapy have been strongly – negatively -- affected by poorly informed laws based on science that has not been adequate. To this end, we have decided to focus on an area of science that holds promise for bringing more comprehensive and more compassionate understanding into the field. Recent advances in both philosophical and sociological studies have opened up a new field that we feel has exciting promise for our purposes: Animal Geography. Animal Geography studies how humans and animals share space. In our case, we intend to advance our understanding of how the dolphin encounter affects the human family, the role of the choices that dolphins make, and how these can be seen from new viewpoints. We believe that we have found strong theoretical and biological frameworks for establishment of the person-hood of dolphins, and even further, that there is a very strong argument to be made that dolphins do exercise intelligent and informed choices, and that we must recognise the rights of dolphins to make their own decisions, especially regarding interaction with humans. Our current situation is this: Amanda and Scott have agreed to sustain a healthy, optimistic, and joyful environment for Scott to return to University studies. Exploring possibilities, we have found that the University of the Sunshine Coast is willing to allow Scott to undertake a year of Honours study, producing a 25,000 word dissertation by early November of 2009 (working title of the dissertation: “The Dolphin-Human encounter: Embassy or Zoo-without-walls?”). Despite not having a Bachelor’s degree, alternative entry has enabled him to enter the University at a level commensurate with his abilities. Following the Honours year, assuming the dissertation is well-received, Scott will then enter the PhD program, aiming at a Doctorate of Philosophy. With a PhD (which we currently intend to be based upon an examination of how Dolphin-Assisted Therapy is understood by the public, by science, by the therapeutic community, and by the patients and their families) we feel we can effectively address the scientific and academic community’s concerns, hopefully redirecting thereby some of the misguided rules, laws, and opinions that have begun to impinge on the human-dolphin connection.